Washington and Nevada also vote on major energy initiatives. In what solar advocates are calling a "David and Goliath battle,” a bipartisan grassroots coalition has successfully defeated a utility-supported measure to put restrictions on solar in the state of Florida. The measure was voted down on Tuesday night, failing to win the 60 percent support it needed to pass. The loss comes despite more than $25 million in backing from large energy companies, with an additional $3.5 million pumped into the campaign days ago. Major contributors include Florida Power and Light, the state’s largest electric utility, and Duke Energy, the second-largest utility. The coalition opposing the measure, Floridians for Solar Choice, is made up of solar companies, environmental organizations, Tea Party groups and elected officials. Florida is a significant new solar market because of its attractive solar resources and support for solar across party lines. Floridians for Solar Choice was the first group to launch a solar ballot initiative in Florida for the 2016 election, in which the group sought to allow for third-party solar power agreements. Currently, Florida law only allows utilities to sell electricity to consumers. The Solar Choice amendment would have removed that limitation, opening up the market to competition. However, as support for third-party agreements gained traction, utilities poured millions of dollars into a new political action group, Consumers for Smart Solar, which launched Amendment 1 to counteract the Solar Choice movement. In December 2015, the ballot initiative led by the Floridians for Solar Choice coalition was abandoned, failing to collect the necessary number of signatures in time to advance the measure. Perfetti and others blamed the Amendment 1 backers for using intentionally misleading language and spending millions of dollars to defeat the pro-solar amendment. The $25 million in the campaign budget would suggest this ballot was considered a significant strategic priority for Florida's utilities. "This is a punch in the jaw"
Amendment 1 was written with language that made it seem focused on expanding solar access in the Sunshine State. But in reality, the amendment would have simply affirmed the right to own and lease solar in Florida -- a right consumers already have. The ballot would also have preserved the monopoly held by utilities and continued to block third-party competitors. Furthermore, Amendment 1 would create "constitutional protection for any state or local law ensuring that residents who do not produce solar energy can abstain from subsidizing its production." In practice, this means that the utility could block any policy it believes is creating a cost shift between customers. If passed, Amendment 1 would have put a damper on potential solar growth in the Sunshine State. It also would have been precedent-setting -- taking issues related to distributed energy compensation outside of the traditional regulatory process where proposals are subject to expert scrutiny. Tom Kimbis, interim president of the Solar Energy Industries Association (SEIA), said the Amendment 1 vote should discourage other utilities from attempting to follow Florida’s lead. “The resounding rejection of Amendment 1 should send a message across not just Florida but all states not to curtail solar choice,” he said. 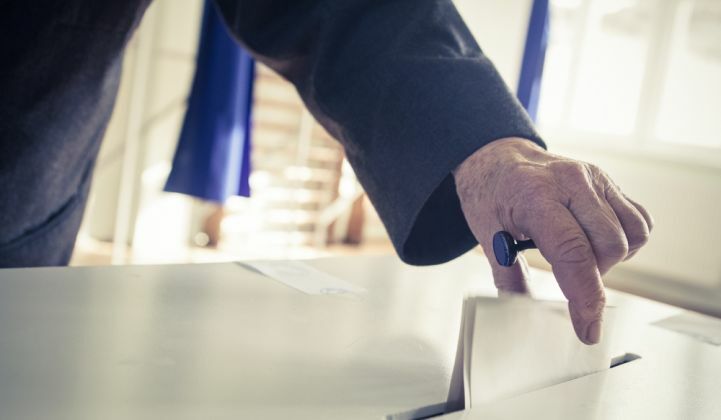 The measure was overcome thanks in part to a surge of opposition following the release of leaked audio recordings, which revealed a utility-supported plan to confuse Florida voters. Editorial boards at every major newspaper in Florida opposed the ballot initiative. “This is such a punch in the jaw to the utilities that sponsored this amendment,” said Scott Thomasson, director of new markets at Vote Solar, in an interview. The defeat of Amendment 1 comes after Floridians voted overwhelmingly in favor of Amendment 4 in the August statewide primary. Specifically, Amendment 4 authorizes the Florida legislature to exempt solar projects on commercial and industrial properties from both the tangible personal property tax and the ad valorem real estate taxes. The referendum sponsor, State Senator Jeff Brandes (R-St. Petersburg), said he considers Amendment 4 to be a catalyst for the Florida market. But Thomasson underscored that the work on Amendment 4 isn’t complete -- the measure still needs to be introduced and approved by the state legislature. With Amendment 1 behind them, Florida’s pro-solar groups will now shift their attention to ensuring that Amendment 4 is implemented swiftly, said Thomasson. Voters in Washington state also rejected a ballot measure in Tuesday’s election. Initiative 732 would have created the nation’s first carbon tax on fossil fuels, with a $15 per metric ton levy on carbon emissions starting in July 2017, set to rise in the following years. But the initiative was defeated amid conflict between green groups. Vox’s David Roberts recently reported that an alliance of progressive and environmental groups in Washington believed the carbon tax policy was “fatally incomplete and insufficient.” Washington’s Alliance for Jobs and Clean Energy, a coalition of climate campaigners formed in 2015, was particularly concerned about the effects on disadvantaged communities. In addition to critiquing the policy design, stakeholders clashed during the negotiation process. The Alliance sought to build consensus around the climate policy before putting it to voters. While Yoram Bauman, an economist at Carbon Washington and author of the carbon tax, felt it was important to take action on the 2016 ballot, even if it meant going it alone. Talks among the two camps ultimately crumbled and support for the tax was fractured heading into voting day, which led to the loss. “While we did not pass the nation’s first carbon tax, many states around the country are looking at I-732 as a model, and we expect a nationwide movement to take root in the years ahead,” said Bauman, in a statement on Tuesday. Washington stakeholders must now address how they will move the climate agenda forward. The Alliance stated that its focus will now shift to state legislature. “We look forward to working with all communities and stakeholders, including I-732’s supporters, to put in place a solution that works for Washington and serves as a strong example for other states,” the organization said. In yet another closely watched ballot decision, Nevada voters have approved a measure to break up NV Energy's legal monopoly. The Energy Choice Initiative calls on lawmakers to create a plan for deregulating the state's electrical market and opening it up to competition. The ballot initiative was primarily backed by the data center company Switch and the Las Vegas Sands casino company. The measure was introduced as large companies sought to ditch NV Energy and find their own providers, but were blocked by high exit fees. "By voting 'yes' on the Energy Choice Initiative, Nevadans have overwhelmingly shown that they want a well-regulated, competitive energy industry, which will create more clean energy options for consumers," said SolarCity Chief Policy Officer Jon Wellinghoff. "We look forward to working closely with Governor Sandoval, the Legislature, and other stakeholders to develop future energy laws and regulations that protect consumers, our environment, and our economy." The Nevada initiative must be approved again in 2018 in order to amend the state constitution.